Audio For Drinking: "People won't be people when they hear this sound"
"People won't be people when they hear this sound"
As is the case at the end of each year, I slowly piece together a mix cd of my favorite tracks from the year. As you can imagine, with all genres fair game, it can be challenging trying to order the songs with an appropriate flow that those with a particular ear for such things seek. The only track that really proved troublesome was the tune I selected to kick of my year-end retrospective of the best songs of 2007. It's selection as the first entry may be because my solution was simply to make it the first song on the mix. Coincidently, it's from the first album I listened to this year that I immediately knew would make the list because it was unlikely I would hear anything else like it. 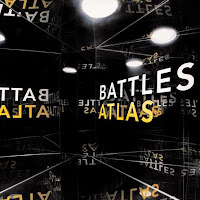 The album is Mirrored by Battles. Post-rock, math rock, prog-rock...whatever you choose to call it; with highly processed vocals and an overwhelmingly fun flair to it, I don't think you can say that Battles sound really fits into whatever expectations come with the utterances of those familiar sounds and their perceived cerebral intimidation. Heavy, rhythmic and unexpectedly melodic, the single off the album, entitled "Atlas," actually became my favorite work-out songs at the gym this year. Curiously drawing upon the gimmicks of glam, the music is bombastic and silly; the contrast between technical and non-sensical eliminating the capability of understanding and leaving only the desire to move and play. It left me imagining a parade of all things nerdy and abstract, a dream begotten by drugs and bad food. and for the record...here are the lyrics..